LANSING, Mich. — Sen. Dale Zorn has introduced legislation to honor Trooper Rodger Adams, who was the 25th Michigan State Police officer to die in the line of duty. On May 14, 1971, Adams and his partner were dispatched to investigate a traffic crash shortly after 1 a.m. As they headed east on U.S. 12 near Tipton Highway, an oncoming car skidded around a curve and crossed the centerline. Adams swerved the patrol car, but he was unable to avoid the oncoming car. The two vehicles hit nearly head-on. Adams was killed instantly, and his partner was seriously injured. If the bill is signed into law, it will have no fiscal impact on the state or local government. State law requires sufficient private contributions to completely cover the cost of erecting and maintaining markers indicating the name of a memorial highway. LANSING, Mich. — Fiat Chrysler Automobiles (FCA) on Tuesday announced it would convert the Mack Avenue Engine factory in Detroit into an assembly plant as part of a $4.5 billion expansion that includes a $119 million investment to relocate Pentastar engine production currently at the Mack factory to the Dundee Engine Plant. “I applaud Fiat Chrysler for the incredible investment they are making in our state and our people. The multi-billion-dollar project will provide exciting new opportunities for Michigan workers and enhance our entire economy. LANSING, Mich. — Sen. Dale Zorn has been appointed by Senate Majority Leader Mike Shirkey to the MiSTEM Advisory Council, which is dedicated to making Michigan a world leader in science, technology, engineering and mathematics (STEM) education. Created in 2015, the council is tasked with overseeing the MiSTEM Network, recommending high-quality programs for funding, and making recommendations to the governor and the Legislature each year on how best to maximize STEM education opportunities for students. Along with two senators and two House members, the council features business, higher education, K-12 education and philanthropic leaders appointed by the governor. LANSING, Mich. — Free fishing! Sen. Dale Zorn is reminding area residents that Saturday and Sunday, Feb. 16-17, mark the first of two free fishing weekends in Michigan this year. The summer weekend is scheduled for June 8-9. During the weekend, all fishing license fees will be waived and vehicles will be able to enter state parks and use boating sites without a recreation passport. Residents and visitors may enjoy fishing on both inland lakes and the Great Lakes for all species of fish, but all fishing regulations still apply. For more information on Winter Free Fishing Weekend, including a list of activities across the state, visit www.michigan.gov/freefishing. The website also includes a link to information about ice fishing in the “Learn to Fish” section. An “Ice Fishing Basics” article features good safety advice and basics on getting started and commonly used equipment. “Winter fishing can be a fun and unique outdoor activity, but remember that it all starts with being safe — which is as easy as following safety procedures and being prepared before heading out on the ice,” Zorn said. “We cannot forget how far we have come in Michigan over the last eight years or take that success for granted. We created a positive environment for growth that has resulted in more than 560,000 jobs being created, renewed optimism, and the ability for us to continue to invest in critical priorities. “We must focus on solutions that fix our roads and infrastructure, provide our students and workers with the education and skills to succeed, and protect our lakes and drinking water. “The people of Michigan sent us to Lansing to work for them, and we have a responsibility to show them that divided government can still be effective in improving the lives of Michigan families and making our state more attractive to new talent and job providers. 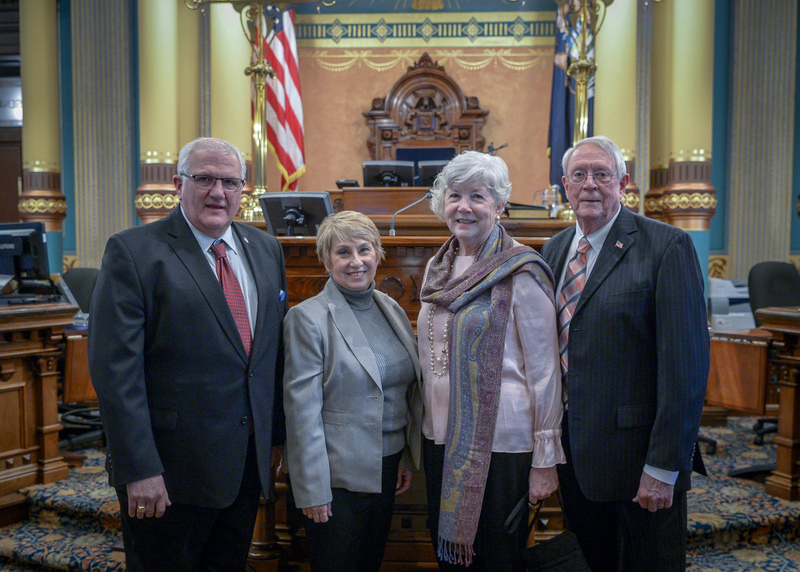 LANSING, Mich. — Sen. Dale Zorn, R-Ida, welcomed Don Taylor and his wife Sharon to the Michigan Capitol on Tuesday night for Gov. Gretchen Whitmer’s 2019 State of the State address. Taylor is a retired entrepreneur from Adrian and was Zorn’s guest on the House floor. Pictured from left: Zorn, Zorn’s wife Cindy, Sharon Taylor, and Don Taylor. Editor’s note: The above photograph of Zorn is available by clicking on the image or by visiting www.SenatorDaleZorn.com/Photowire. LANSING, Mich. — Sen. Dale Zorn will be available for comments following the governor’s 2019 State of the State address on Tuesday. Sen. Dale Zorn, R-Ida, chairman of the Local Government Committee. Reaction and comments following the governor’s State of the State address. Immediately following the address, which is scheduled to begin at 7 p.m. on Tuesday, Feb. 12. Zorn will be available following the State of the State address for comments on state issues mentioned by the governor in the address. 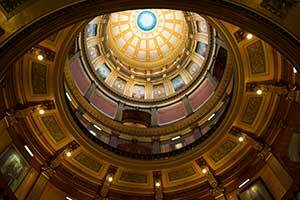 Please call Paul Egnatuk at (269) 209-3867 to schedule an interview time with the senator. “John Dingell was committed to service, dedicated to his constituents, clear in his goals, and always focused on working with people to find common ground and get results. “He was a true gentleman. No matter what side of the aisle we came from, my congressman treated us all with dignity.